Small businesses sold in 2016 on pace to break record. 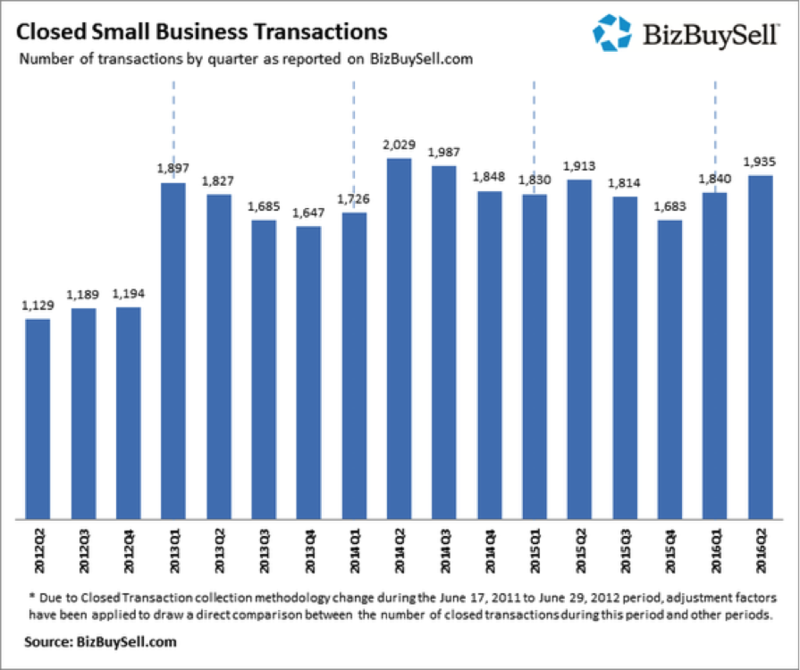 BizBuySell.com, the Internet’s largest business-for-sale marketplace, reported recently that the total number of small businesses changing hands in the first half of 2016 represents an increase from not only last year, but from the record-setting 2014 as well. If the trend continues, 2016 will be the best year on record. BizBuySell.com gathers statistics from business-for-sale transactions reported by participating business brokers nationwide. A total of 1,935 closed transactions were reported in the second quarter of 2016, bringing the year-to-date total to 3,775. The median revenue of sold businesses in the second quarter of 2016 was $441,331, while the median cash flow of the businesses was $105,000. The median price of the sold businesses was $199,000. The selling price computes to an average of 61 percent of revenue and an average multiple of 2.26 times cash flow. These ratios have remained fairly consistent over the past several years indicating a stable market. Interestingly, the highest selling prices expressed as a multiple of cash flow were in Atlanta, Chicago and Philadelphia. The lowest were found in Boston, Phoenix and Orange County, California. Small businesses sold in the second quarter recorded a median of 178 days on the market, a slight improvement from the 188 days in the previous quarter. This puts the average time to sell a small business at approximately 6 months. Andrew Miles is a business broker and an Accredited Business Intermediary assisting buyers and sellers of privately held businesses in the valuation and transfer of ownership. He participated the BizBuySell.com survey quoted above. He may be reached at (704) 779-2177 or by email at Andrew@BridgeMergers.com.